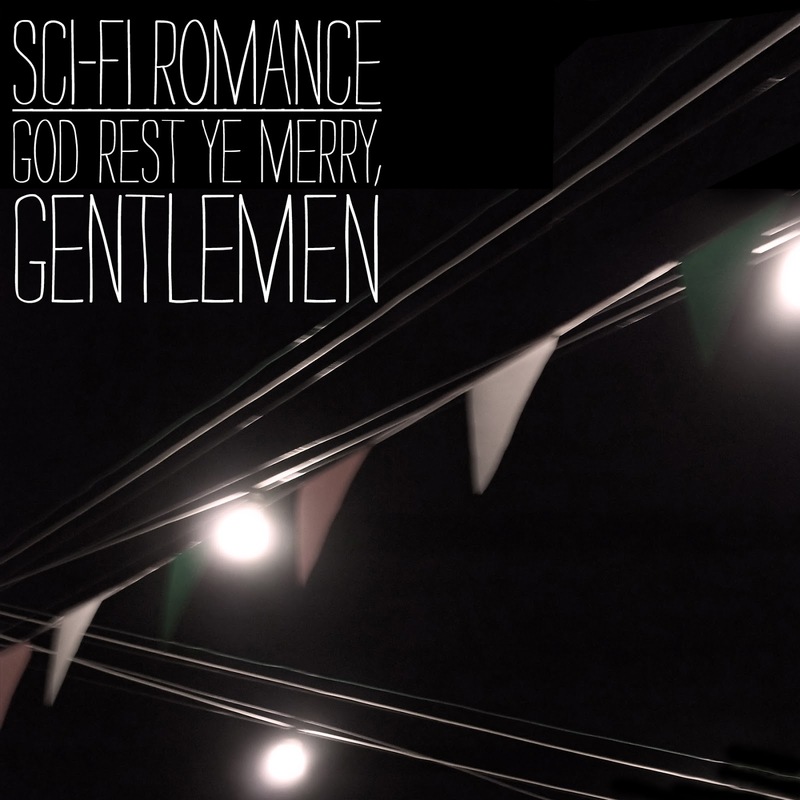 Two years ago, I released the fist Sci-Fi Romance album, …and surrender my body to the flames, and that holiday season, put out a version of my favorite traditional holiday song — and staple of Jimmy Stewart movies — Auld Lang Syne. It seemed appropriate, then, that with the release of our album The Ghost of John Henry earlier this year, that we should put something else out around the holidays as a thank you to fans, friends, and everybody who made 2012 such a surprising and wonderful year for us. I give you, then, our version of God Rest Ye Merry, Gentlemen, which I wager is not like the versions of this song you are used to hearing. Or, I hope it isn’t. I mean, we played it at about 190 beats-per-minute, for one thing. Listen here, or head straight to the download page, where you can get it either for free or for however much you care to pay. I had the idea for this take on the song last year, but it didn’t crystallize in time for us to get it recorded for the 2011 holidays. I’m glad I waited. Over the summer, I met Tim Moore at Mas Music Productions here in LA. He mixed and mastered our track Walk a Mile, which we’d been invited to contribute to a London Olympics-based compilation. We learned this song last Saturday and played it live at our last show of the year that evening. It went well, so I called Tim to see if he could get us in quickly. He was again wonderful to work with, and his contributions to this recording were tremendous. We wrapped the track with about an hour left on our block in the studio. Kurt and Jody had taken off, and I didn’t want the time to go to waste, so I grabbed some brushes, the guitar, the bass, then hopped back into the booth and did a quick version of another traditional Christmas song, which I’m including as a B-side on this release. It’s one of my favorites, and I hope you guys enjoy it. Finally, I went back and forth about whether or not I should say something about this, but I feel not to would be wrong: I booked our studio time on Thursday, December 13, and we recorded on Saturday, December 15. The day in between was the day of the unthinkable tragedy in Newtown, Connecticut. By the time I got to the studio, there was less of me. My soul had been diminished since the morning before. And I really struggled with the idea of recording a Christmas song about joy in light of what had happened. In the end, I believe that one of the jobs of artists is to help people, to transport them, to give them hope when hope seems out of reach. We likely did not do that in our three-minute Christmas song. But to fail to try would have felt like an abdication. I recognize that we are now marching into this holiday season differently than we were a week ago. But there are still many, many reasons to be joyful, and thankful. I am deeply thankful for all of you. I could not have anticipated the shape of 2012, and you have given it a lovely one for us. Thank you, and may God rest ye merry. There are moments where life just makes me so tremendously happy and thankful. This is one of those. One of the things Mike and I have in common is that the only art we buy these days and display in our homes is handmade, and he hoped to come up with something that would stand alone as a work of art even beyond somebody’s enjoyment/familiarity with the latest album from my band. In my mind, he succeeded well beyond my expectations. Listen, I made a whole record about John Henry – a story and folk song that has stuck with me since I was about eight years old. One of the themes of the album is that the work of human hands is powerful and meaningful. There is almost nothing that could give me more pleasure then, but to make these amazing posters available to our fans. 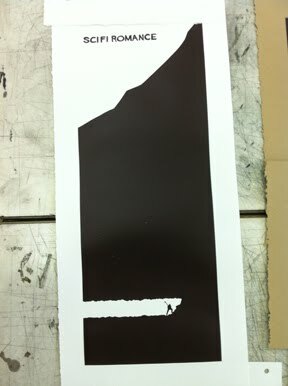 These are LIMITED RUN, handmade silk screened posters inspired by the album. They are available on two types of paper, a white edition (21.25″ x 9.25″ in.) that there are 24 of in the world, and a gold edition (22″ x 10″ in.) that there are only six of in the world. Seriously, six. In the world. They started selling at our most recent gig, and will likely not last long. Grab one while you can. And thank you all for making 2012 such an amazing year. We were recording the album at this time one year ago, and we could not have imagined the response it has received. We continue to be thankful, and extremely humbled. Making art that inspires other art is about the highest form of praise that I can think of. Cheers. And may 2013 bring you many blessings. Coming Soon – Folk Art! I like computers, they’re fine. Every piece of music I’ve recorded this millennium has been aided in some way by computers, although I usually try for as non-digital a sound as I can manage. Some people dinged us on the latest album for it not sounding “perfect,” but I wanted the sound of people making music, not something that came out of a can. So if I mis-fretted a note here or there or plucked a string a little too hard, what of it? There’s still magic in the work of people’s hands. To that end, I’m thrilled to be able to tease out some info about the Sci-Fi Romance The Ghost of John Henry hand-made, silkscreened poster. LA-based illustrator and artist Mike Estano has designed, cut, and hand-pulled/printed some amazing, limited edition signed and numbered posters inspired by the album. 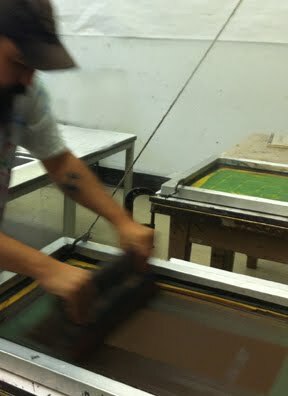 Mr. Mike, inking the first screen. We’re playing this Saturday night in Hollywood, and the posters will go on sale for the first time there. After that, I’ll post images of the finished poster and you’ll be able to get them from the Sci-Fi Romance website, or from me, should you happen to run into me someplace. When Mike first ran the idea past me, he said his goal was to make something that would be artistically and aesthetically engaging, even apart from the music, and he’s more than accomplished that. These things are just itching to get framed.